The weather in Newbridge was a nuisance, but we still had a busy weekend of GAA action to keep us occupied. 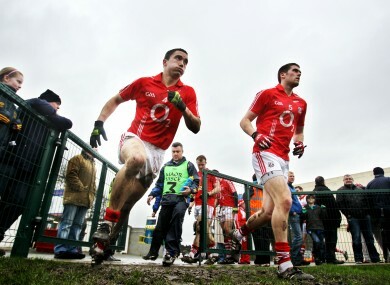 Cork's Kevin Harrington and Conor O'Driscoll take to the field in Clonmel yesterday. Tipperary 0-06 Cork 0-13 CORK CLAIMED THEIR sixth McGrath Cup with a relatively comfortable win over Tipperary in Clonmel, though the Rebels had goalkeeper Ken O’Halloran to thank for preserving their lead late on. O’Halloran, who was deputising for regular keeper Alan Quirke, did his claims for a regular starting place no harm as he made three fine saves to deny Tipp in the closing stages. Paul Kerrigan and Fintan Goold led the scoring for Cork with four and three points respectively, but speaking to RTÉ afterwards, Goold paid tribute to O’Halloran. Wexford 1-06 Laois 1-15 An early goal from Paul Cahillane set Laois on the road to a confidence-boosting win over Wexford in the O’Byrne Shield at Wexford Park. Laois begin their return to the National Football League Division 1 against Mayo on Saturday evening, and they struck the front early when Cahillane scored after just three minutes. Some slack defending allowed Paddy Byrne to cancel out the goal before half-time, but Justin McNulty’s men took a 1-09 to 1-03 lead into the break and closed out a comfortable win in the second half. Clare 3-25 Waterford IT 0-05 Davy Fitzgerald celebrated his first victory as Clare hurling manager by predicting that his young squad will become “very competitive” within two or three years. Fitzgerald watched from the sidelines as Clare hammered a understrength Waterford IT side at Sixemilebridge yesterday. The game was over as a contest before the break as first-half goals from Aaron Cunningham and Daire Keane gave the Banner men a 2-14 to 0-3 lead at the interval. Next up for Clare are Limerick, who await in Sunday’s quarter-final. Email “GAA round-up: O'Halloran shines for Cork, Davy Fitz gets the Banner back to winning ways”. Feedback on “GAA round-up: O'Halloran shines for Cork, Davy Fitz gets the Banner back to winning ways”.